A view of the plant nursery at the Lake Waco Wetlands. Photo courtesy of Sharon Peregrine Johnson. Lake Waco is the primary source of usable water for the city of Waco, Texas and several surrounding communities. The City of Waco City Council voted in 1998 to raise the level of Lake Waco by seven feet, which in return would provide over 20,177 acre/feet more water. As a result, the City of Waco, the U.S. Army Corps of Engineer Fort Worth District and the U.S. Fish & Wildlife Service began construction in October 2001 of a 180-acre freshwater marsh near Lake Waco as partial fulfillment of replacing habitat that was lost due to the pool rise. The Lake Waco Wetlands was designed by Wetland Technologies, Inc. of Houston, Texas and constructed by the City of Waco, with help from the U.S. Army Corps of Engineers (Fort Worth District) and Baylor University. The wetland is located on the north arm of the Bosque River in Waco on property leased from the U.S. Army Corps of Engineers Fort Worth District. Initially, an aquatic plant nursery was established, native aquatic plants within a 200-mile radius from Waco were harvested, brought back and planted in the wetlands. Soon after the completion of the nursery, four wetland cells totaling 180 acres were established. Water from the Bosque River is pumped into an infall basin located in the upper end of the wetland, and then by gravity, the water flows through the cells, and is returned into the outflow channel back into the Bosque River, continuing its journey into Lake Waco. The Lake Waco Wetlands treat about 11 million gallons of water per day. The wetland is large enough to retain the 11 million gallons for 7 to 10 days before returning into the river. The North Bosque River contributes 75 percent of the inflow to Lake Waco. The Bosque River has pollution issues including high nitrogen and phosphorus levels. The wetlands or “nature’s kidneys”, help filter out some of these nutrients and sediment and returns “treated” water back into the river. 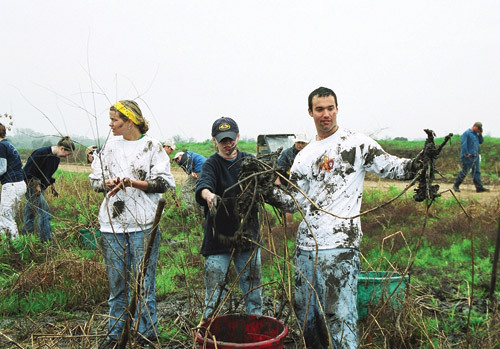 Volunteers pitch in to help establish the plant nursery at the wetlands in 2001. Photo courtesy of Annette Jones. The Lake Waco Wetland provides valuable habitat to numerous aquatic plants, prairie plants, wetland insects, amphibians, reptiles, mammals, and over 130 bird species. The three ecosystems located on site vary from upland forested, bottomland riparian forested and the freshwater marsh. The animals and insects have all come into the wetlands on their own and continue to feed, make their homes and nest on wetland property. Approximately 24 species of aquatic macrophytes are currently found at the wetland. 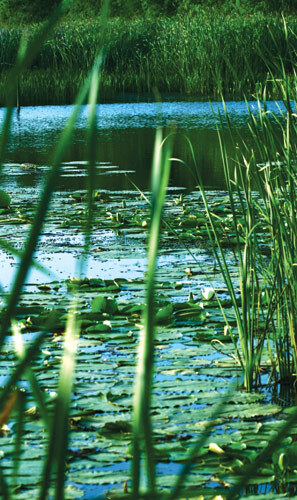 Efforts were made from the beginning of the project to establish native aquatic vegetation, and aggressive species such as cattails were not planted. Not surprisingly, cattails are now abundant, and the city has worked to control non-native species such as Hydrilla and Arundo donax (giant cane). Changes in the plant community over time are being tracked. A variety of wildlife species inhabit the wetland. The local chapter of the Audubon Society has documented 139 species of birds at the wetland to date, and data was collected for Texas Amphibian Watch documented 6 species of frogs calling. Ducks and geese have been abundant, and roseate spoonbills and anhingas have made surprise appearances. Some less desirable inhabitants have included cattle egret and nutria. Hands-on wetland planting by volunteers continue in the fall and spring months. Photo courtesy by Annette Jones. The Lake Waco Wetland also provides excellent opportunities for research and education. The wetland provides a valuable opportunity for the public to obtain information about the importance of wetlands and water conservation issues. Baylor University, through the Biology Department, developed the Center for Reservoir and Aquatic Systems Research (CRASR), to enhance aquatic research opportunities for students and professors. The Research and Education Center is 6,000 square feet with a 1,500 square foot research area (Baylor University’s CRASR site), a 2,000 square foot nature center, and a 900 square foot indoor classroom installed with basic science equipment. Along some of the walking trails, observation platforms are constructed to provide access to the wetland for wildlife viewing. Baylor University has been an active partner with the City of Waco in the wetland project from the very beginning. Dr. Robert Doyle, Dean of Biology and Director of the CRASR at Baylor University, provided assistance in plant selection and establishment, and now teaches a wetland ecology course utilizing the Lake Waco Wetlands as an outdoor classroom and research project site. 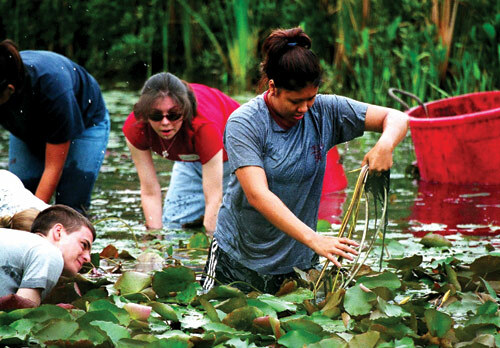 Several students are conducting graduate-level research in biology at the wetland, and other departments such as Geology and Environmental Studies have also been active. An additional experimental station is being constructed on site at the wetlands, the BEAR (Baylor Experimental Aquatic Research) facility will feature sixteen pond mesocosms (miniature wetlands) and twelve experimental stream mesocosms, these will mimic natural wetlands and stream habitats found in Central Texas. According to Dr. Ryan King, Assistant Professor for the CRASR, the goal is to identify the critical concentrations of nutrients that cause imbalances in the natural assembly of organisms, which will ultimately help develop water-quality criteria that protect aquatic resources in Texas from excessive pollution. The community outreach and education aspect of the wetland project has exceeded project leaders expectations, and only shows signs of increasing in the future. “Community support and involvement have without a doubt been the greatest success story of the wetland so far,” says Conry, noting “we’ve given out over 5,000 t-shirts during wetland plantings. We want to continue to build on that success and expand educational opportunities for people.” Guide books for wetland birds and another on wetland plants have been completed thanks in part by an Environmental Education EPA grant and are helpful resources in interpreting the plants and animals at the Lake Waco Wetlands. To date, there have been over 6, 000 volunteers out in the wetlands either harvesting, transplanting or maintaining the wetland plants this is equal to 10,000 volunteer hours that have been donated to the establishment of the wetlands. School groups and organizations continually participate in Fall and Spring plantings. Many of these groups are from the greater Waco area, but others have traveled as far away as San Antonio, Austin and Dallas. Locally, three major colleges and universities and over 24 independent school districts have participated in the volunteer opportunities offered at the wetland. The Lake Waco Wetland including the Research and Education Center is very unique to the community because within a 200-mile radius, it is the only wetland open to the public. The local community as well as people from as far away as Dallas and Austin have come to participate in wetland activities and attend workshops and programs on this natural environment. The City of Waco is the major financial institution responsible for the every day upkeep of the wetland and the Research and Education Center, and has entered into an agreement with Baylor University (CRASR and BEAR) and through their funding have been able to expand on the ongoing water research programs that are offered at the wetland facility. The research obtained by these localized studies will not only help Baylor University, but the city of Waco and its citizens by shared information on the quality of water in the North Bosque River. For additional information about the Lake Waco Wetlands Project, visit the City of Waco website at: http://www.waco-texas.com/city_depts/waterutilities/wetlands.htm or contact Nora Schell, Program Coordinator at the Lake Waco Wetlands, at noras@ci.waco.tx.us , (254) 848-9654 office.